This account differs than other collection because it focuses at greater length on political and religious subtleties, and develops an imposing cast of supporting characters. 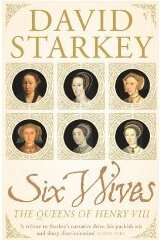 The bulk of the book inevitably deals with Henry’s first two wives, Catherine of Aragon and Anne Boleyn. Accounts of the remaining queens are fleshed out nicely to suggest their personalities, their place in the family networks and religious currents at court and the overall patterns of the king’s infatuations and disillusionments.